Surprise her with one of our gift cards so that she can pick out whatever she likes, whenever she wants. Gift cards are valid for a year from purchase date. The value in gift cards are not exchangeable for cash. 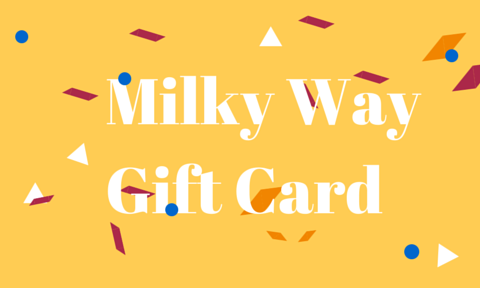 Gift cards must be applied to purchases made on the Milky Way e-commerce site. Recipients will receive an email informing them of their gift, with details to log into their account. It is the responsibility of the recipient to safeguard the email containing information on the e-gift card. [Amounts from purchases will be deducted from the value of the gift card and balance can be used for future purchases]. If purchases exceed the value of the gift card, recipients will be able to make the payment for the balance during check-out. Members' discount cannot be applied to the purchase of gift cards.